Do you live or work in Dallas, TX? Are you looking to get rid of junk or debris cluttering up your home, condo, apartment or place of business? Well if this reminds you of your current situation, then I have the perfect remedy to your junk woes. The Stand Up Guys Junk Removal Crew! 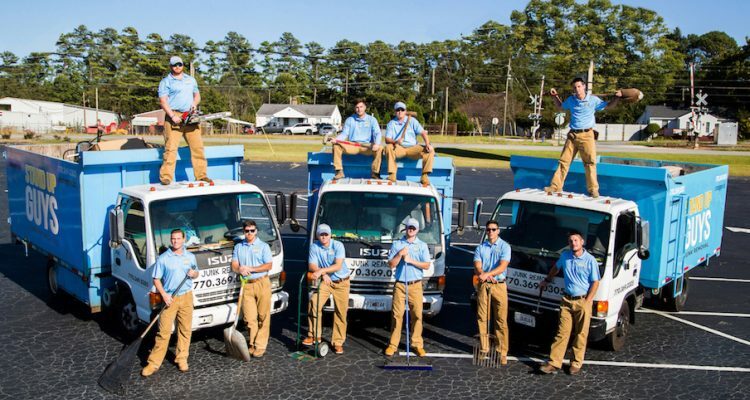 The Stand Up Guys are not only Dallas’s Favorite Junk Removal Crew, we are easily the best there is! Yes, we can back that statement up. Over the years The Stand Up Guys have earned a stellar reputation and rapport with the residents and businesses of Dallas. We’ve earned this rep through our multitude of efforts towards amazing customer service and customer care at all times. We ensure that our customers are not only satisfied with our services, but WOW’d by them. This has turned Stand Up Guys Junk Removal into a staple of Dallas! Another big reason why the people and businesses of Dallas have fallen in love with The Stand Up Guys over the years is because of our continuous efforts towards giving back to the community. We believe that most items we remove can find a new home after they leave yours. This is why we donate and recycle more than 60% of the items we remove. We donate couches, cloths, dressers, and all types of furniture back into the community. This helps to not overfill the landfills and helps give back to those in needs. Dallas is a massive city located in the heart of Texas. The city of Dallas has well over 1.3 million people, making it not only one of the largest cities in Texas but one of the largest, most populated cities in the entire United States. The Dallas-Fort Worth Metro Area is even larger than that, consisting of more that 7 million people, making it the 5th largest metropolitan city in the country! Dallas is also the largest inland metropolitan area in the United States that lacks any navigable link to the sea. The accolades of Dallas’s size are endless, but that’s not the only thing that makes this city great! Dallas has years and years of history behind it. The city was first pronounced an official city of Texas in 1845. Dallas in perfectly aligned with the north and east end of Texas, making it perfect for construction of major railroads all throughout Dallas allowing access to cotton, cattle, and later oil in North and East Texas. These railroads quickly made Dallas a major trade center in Texas. This helped the city boom by the turn of the century. The city would never look back, as it grew year in and year out in size and scope. Making it one of the largest, most popular cities in the world.